The time period from the early part of the last century is what we crave. For one night every month we intend to give you exactly that: the most unusual time-honoured music event in London in a beautiful period venue. We are not just playing at 78 revolutions per minute, we are living it! Our mission is to promote music of the 1920s through to the 1940s by holding events with an art deco feel and original 78 rpm recordings played on vintage equipment - not a CD or laptop in sight. Revelers dress up in the spirit of things with suitably period atire, and many a vintage hairstyle is glamorously on display. We are celebrating the era of swing the way it ought to be celebrated - in mono, full of depth and rounded tone and that atmospheric crackle and hiss. We are paying homage to the raving party music from a choice era and rollicking to the records on which the music was originally issued! 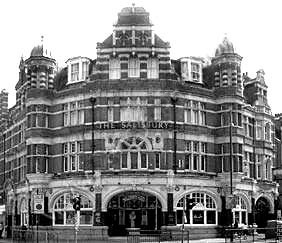 Events are regulalrly held at The Salisbury Public House and Hotel on Green Lanes, North London. This huge, late Victorian grade II listed building was beautifully and authentically restored in 2003 and now evokes the prestigious character that it enjoyed at the turn of the former century, from the stained glass skylights and the original carved wood bar and mosaic floor, to the cozy alcoves where patrons can sit and sip a drink or two whilst soaking up the atmosphere of a twenties speakeasy. Used as a location for Richard Attenborough's Charlie Chaplin biopic, the public house has received many commendations not just for its impressively authentic restoration, but also for its high standard of gastro fare, selection of European ales, and friendly service. We invite all attendees to wear their most glamorous jazz-age glad-rags or most dignified period duds, but it's not a requirement. Whether you simply want to immerse yourself in a night of unabashed glamour, or be mesmerised by the wonderfully impressive swing dancing, there is something for every-one. Why not come early for scrumptious meals at this comfortably plush gastro-pub or the nearby restaurants? There really is no other club-night like it in London. 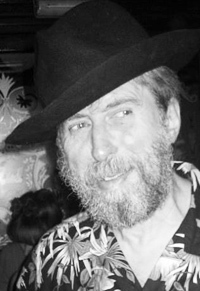 Paul has been collecting 78s since the age of 13 and has been DJing for over 30 years. 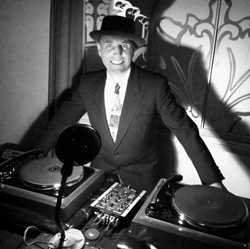 He re-introduced 78s onto the scene in the mid-80s and has since DJ'd and been at the forefront of most of the top vintage swing events in London and the UK: Nighthawks, Hellzapoppin,The Lady Luck Club, Saturday Night Swing, Black Cotton Club, Swingland, Shugapush, European Blues Invasaion, Camp Bestival, Big Swing on the Gardens, Bristol Lindy Exchange, Hep Cats, Last Tuesday Society, The Third Thursday Jazz Club, Cakewalk Revival, Delirium and Elysian Den, amongst several others. "My passions are recordings from the mid '20s to the early '30s, especially earlier New Orleans recordings, where the playing is looser, but at the same time incongruously tighter. The period from the late '20s through to mid '30s to me are the absolute pinnacle, with magical solos from the best players there have ever been. Nobody can compare to the likes of King Oliver, Duke Ellington, Fletcher Henderson, Thomas Morris, Clarence Williams and many other long forgotten names. They not only made Jazz, but shaped it and sent it on it's long journey, influencing every other music style that came after it. I wanted to ensure that this wonderful period of music was shared with a wider audience, so this talent is not forgotten. I first fell in love with Jazz as a child and it brings back great memories of my grandparents dancing to British dance bands on their HMV radio. So I guess it's no coincidence today that I have amassed a collection of 78s from that time and now dance around my home with my other half, (and yes I also have a few HMV radios that I have restored)." Paul is also an accomplished dancer and has taught dance workshops both in the UK and abroad, favouring Balboa out of the early jazz dances. Paul has been running Mouthful O’ Jam for over eight years. "As DJ's we felt constrained by what we should play, what style, for how long etc… and so we decided to set up our own club, with best friend and fellow dance enthusiast Gaia Hannan. Here we are 8 years on and still drawing the best of the dancers on the scene, as well as a wonderful amount of new dancers, young and old to the club. Our youngest member is 19 and oldest, 83. We get people coming to the club from all over the world, sometimes arriving straight from the airport with their cases, so they don’t miss the night. Apparently in the US, our club is considered to be an unmissable, underground gem on the London swing scene. Which may be why we were voted London Vintage Awards Best Club Night. We now have over 1000 members, who dress to impress and always look the part, which makes for a great, glam evening. The emphasis of our night is on having a good time and not how well you can dance and we want everyone to leave with a smile, after a fabulous night out with great people. We love what we do and our passion and that of our resident Dj's, Tim Hellzapoppin, Kid Krupa and Stompdown Geoff, is felt every time we run a night. It's electric !" Paul has spent several years putting together the perfect equipment, with advice from retired music industry experts from around the world, alleviating the snap, crackle and pop that is usually heard with 78s, so that the records sound as they should. Paul has now created a world class, tailor-made 78 system, with his own custom-designed turntables, valve equipment and Art Deco speakers. When not record collecting, he divides his time between monthly Mouthfuls and his Château in Normandy. 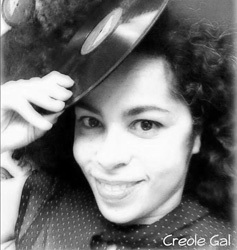 Helping coordinate and organize this is DJ Creole Gal - aka Emma Newton. Often found at the entrance to the gig ensuring a warm welcome for guests, Emma is the 'people person' for Mouthful O' Jam. Organizing these events requires liaising with many different parties, including the management of the premises, the guest DJs and even the media and the press. Emma's engraciating social skills ensures that everyone is on board and (if you'll excuse the mixed metaphor) in the loop. "One of my favourite roles is helping to plan the birthday celebrations. We usually have at least a couple every Mouthful, as our nights have really turned into just great parties with wonderful friends. So people love to celebrate their birthdays here. Being French of course means that I think 'everyone should eat cake', so I'm also the cake and candle lady. However we do ensure that everyone gets the opportunity to dance off the extra pounds with a birthday dance after they blow out the candles!" Jazz formed a major part of Emma's life from a young age. "I was brought up with jazz being played all the time in the house, as my father was a jazz pianist and founder member of Ronnie Scott's. He played jazz piano every night. I first started jamming along with him on my recorder from the age of 6. Then progressed onto the piano, as we had two at opposite ends of the room and finally onto an Alto sax. We still play music (and dance to it) all the time in my house, either on the hi-fi, or on the various instruments I have collected from all over the world. (I have three accordeons, but can't play any of them!). It was really only a question of time before I brought my passion for music to the decks". "The biggest buzz of being part of the Mouthful crew, is that all our DJs and teachers are equally passionate about what they do. It is quite hard to get on the decks sometimes, as there is usually a guest DJ or two at every Mouthful O' Jam event, on top of our resident DJs Kid Krupa, Swing Maniac, and Stompdown Geoff, feeding of their mutual frenzy for the music and the latest shellac gem they have discovered". "This passion is infectious and has infused the dance floor and our regulars, fuelling their own desire to dance their socks off and ultimately stretching their talent and experimentation with their moves. For me the dancing is just an extension of the music, as when the shellac spins you just can't sit still. It's a fantastic spectacle to watch". By day, Emma divides her time between her property interests and her Film and TV projects. By night her other talents can be seen on London’s top dance floors. Gaia has been dancing Lindy Hop, Charleston, Swing, Blues and Balboa since the age of 15 and has had the privilege of teaching swing dancing in many cities around the world including Rome and Dubai. 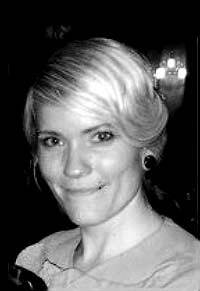 "I started teaching privately in America in 1999 focussing on Lindy Hop, Charleston and Blues. Currently beginners and intermediates can attend workshops in North London, where they are taken through the basics of East Coast Swing, Lindy Hop, Balboa and/or Charleston steps." 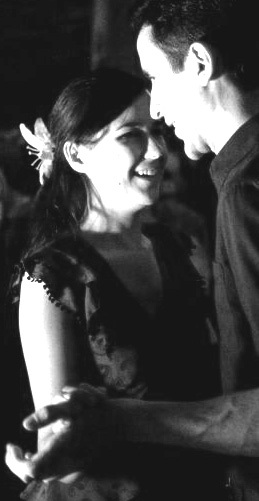 With over 20 years of experience in Lindy Hop Gaia happily brings her passion for vintage style partner dancing to you, providing an open and welcoming atmosphere for events and classes in convenient locations in London or for your special private event or occasion. Geoff is the latest addition to the Mouthful team, having first been lured in by the music and dancing about seven years ago. Paul’s right-hand man, he helps keep our vintage sound system operating smoothly. An avid record collector, he has a wide ranging selection of 78 records that he rolls out for our amazing dancers. "I can’t get over getting to play such incredible records for some of the greatest dancers in town. It just blows me away again and again." When Geoff is not behind the decks, you’ll generally find him on the dance floor. A self-confessed balboa fanatic, nothing makes him happier than merging with the music as he shuffles and slides around the room. That’s not to say, of course, that you won’t see him swinging out with the lindy hoppers or grooving in to some smooth blues! "It’s all about the music, never mind the steps and the moves. You’ve got to get in there and feel it, let it flow out in the dance."